Today only at Amazon, you can get a Remington Shine Therapy Moisturizing and Conditioning Digital Ceramic Hair Straightener for $21.99 with free shipping. This regularly costs $49.99 and has excellent reviews! Get 86 percent more shine with the Remington Style Therapy: Shine Therapy 1-Inch Flat Iron. This straightener features ceramic plates infused with avocado and vitamin E conditioners that are evenly emitted onto the hair during styling to add shine and protect hair from unnecessary thermal stress. 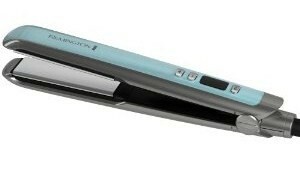 The straightener reaches a top heat of 430 degrees Fahrenheit in 30 seconds for fast, long-lasting results. An LCD display with temperature lock makes for precise temperature adjustments.